The four novices in this pioneer society were forced to vacate their first house and moved to a rented house at 610 George St. in the city. Here in their chapel the four women took their vows and the first women religious order of women of African descent was officially founded on July 2, 1829. In December of that year the four sisters and the school moved to a rowhouse at 48 Richmond Street. This location would be the motherhouse for the order for the next thirty one years. In the next few years the order and school quickly outgrew the rowhouse and purchased some adjoining properties. A bigger school and new chapel were built in 1836. The new chapel is especially significant because it was not only for the use of the convent of the Oblate Sisters of Providence but was also used by Baltimore's black Catholics. This would be the first time American black Catholics had their own separate chapel for worship, baptisms, marriages, confirmations and funerals. The order continued to prosper and grow through the early 1840s. However, the death of Father Joubert in 1843 left the Oblates without the person who had helped and supported them from their inception. Since their primary mission was the education of men for the religious life, the Sulpicians decided not to minister to the Oblates any longer. At the same time paid enrollment in the school began to wane and by 1846 there were only eight students in the school who paid tuition. The order asked permission from the Bishop to beg on the streets in order to help support the convent. Adding to the order's troubles, one of the original founding members, Mother Theresa Duchemin, left the order. She traveled to Michigan where she helped found the Sisters, Servants of the Immaculate Heart of Mary (IHM ), an order that would grow to become one of the largest started in the United States. These were years that required the determination, faith and perseverance for the the Oblate Sisters of Providence. Since the Sulpicians no longer ministered to the sisters on a regular basis, the Oblates began to walk the short distance to St. Alphonsus for the sacraments. St. Alphonsus was a church conducted under the direction of the Redemptorist order and generally served the Baltimore's growing German community. Through their association with the Redemptorists the sisters met Father Thaddeus Anwander, CSsR. 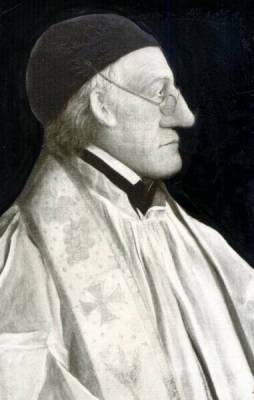 who became their ecclesiastical director in 1847. Under Fr. Anwander the order again began to grow and prosper. A separate school was opened on the property and the first time the Oblates began to teach boys. 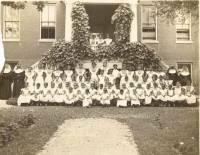 The sisters opened other Catholic schools for African American girls in the city as well as teaching adult women in evening classes and opened a home for widows. In 1860 the sisters were notified that the Redemptorists were giving up their directorship of the community. The Redemptorists and especially Fr. Anwander had been their friends and helpers for thirteen years, helping bring them from the brink of extinction to a degree of financial security. Because of his devotion, commitment, and exceptional guidance, Fr. Anwander is considered the Oblates' second founder.. The order then came under the directorship of the Society of Jesus (Jesuits). Under the directorship of the Jesuits the OSPs for the first time began missions outside of Baltimore. They opened a mission in Philadelphia in 1863 and one in New Orleans in 1867. The order remained under the directorship of the Jesuits until 1871 when priests from the Josephite Fathers and Brothers became their directors. This was a natural alliance since the mission of the Josephites is to minister to the African American population. The official directorship lasted until the mandate of an ecclesiastical director was rescinded in the early twentieth century. Eventually the order founded schools in eighteen states. Some missions only lasted a few years while others endured and changed with the needs of the community. By the 1950's there were over 300 Oblate Sisters of Providence teaching and caring for African American children. In 1871 the sisters vacated the motherhouse on Richmond St. because the city needed the property. A new location was found on a knoll on what was then the outskirts of the city and a new motherhouse was built on Chase St. The sisters continued to operate an orphanage as well as a day and boarding school within the convent walls. The motherhouse remained on Chase Street in Baltimore until a new motherhouse was built in 1961 at 701 Gun Rd. in southwest Baltimore County. It is called Our Lady of Mount Providence and remains the order's motherhouse today. Several missions operated on the motherhouse property including Mt. Providence Junior College from 1963-1966. The motherhouse houses the order's administrative offices, a health care unit, a novitiate (there is also a novitiate in Costa Rica), the Mother Lange Guild ( supporting the Cause for canonization of Mother Lange), and the Oblate Sisters of Providence Archives and Special Collections Library. Offices for the the affiliated organizations of the National Oblate Sisters of Providence Alumni Association and Cojourners of the Oblate Sisters of Providence are located at the Motherhouse. The sisterhood has operated a Child Development Center and Reading and Math Center since 1972 on the Motherhouse property. Currently the order has approximately eighty members. The Oblate Sisters continue in Baltimore, Maryland, Miami, Florida, Buffalo, New York, Alajuela and Siquirres, Costa Rica.